It's easy to grow things. Everyone should grow something. 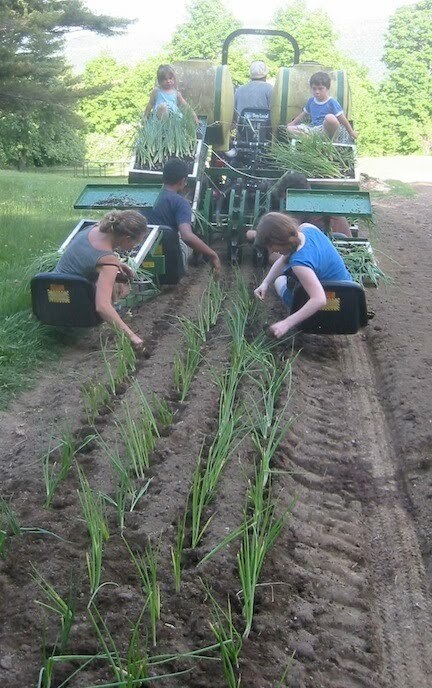 Most of our farm veggies are raised using fairly primitive methods. We dig holes by hand, avoid all synthetic fertilizers and herbicides, and harvest using nothing more than a pocket knife. The only motorized tool we use regularly is a rototiller. But occasionally -- and by occasionally, I mean once or twice a season at most -- we bust out the big guns. 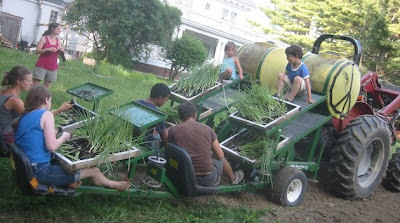 When I first laid eyes on our transplanter I couldn't fathom what it was used for. It's actually pretty simple. There's a large wheel that divots holes in the ground. Water gets poured in from those big yellow tanks. 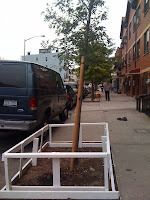 And four people trail behind on chairs dropping plants seeded in the greenhouse into the holes. The two small children sitting on top are optional. It's kind of a comical scene, at least when we do it. Our tractor doesn't have a creeper gear, so we really have to rush to keep up. It's a lot like that scene from I Love Lucy in the chocolate factory, when Lucy and Ethel race to keep with the assembly line. At another farm I work at, the transplanter has a "six-shooter" -- sort of like a gun barrel where you throw the plants and they got shot into the ground, which helps move the whole process along smoothly. But even having to stop for catch-ups pretty regularly, and some quick covering up after the machine passes, the transplanter still creates the most perfect neat rows, and quickly. The onions planted in that picture went in the ground and at the end of May and we just pulled them up a few weeks ago. You can't quite taste the straightness of the rows they grew in, but they were still pretty tasty. 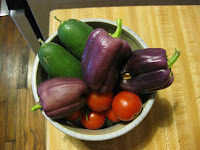 I haven't gotten around to the pickling project just yet, so today's post takes us on a quick detour from the lofty details of our rooftop garden and down into the streets below for a look at some of the local foliage. Bushwick has had a rough time of it over the last 40 years or so... in the blackouts of '77 looting and fires ripped through the area, leaving ruined buildings and bombed out lots pockmarking an already depressed area plagued by arson and the drug trade. Abandonment, corruption, and crime took root, and commercial strips like Broadway and Knickerbocker Avenue were either half vacant or bloomed into open air drug markets. 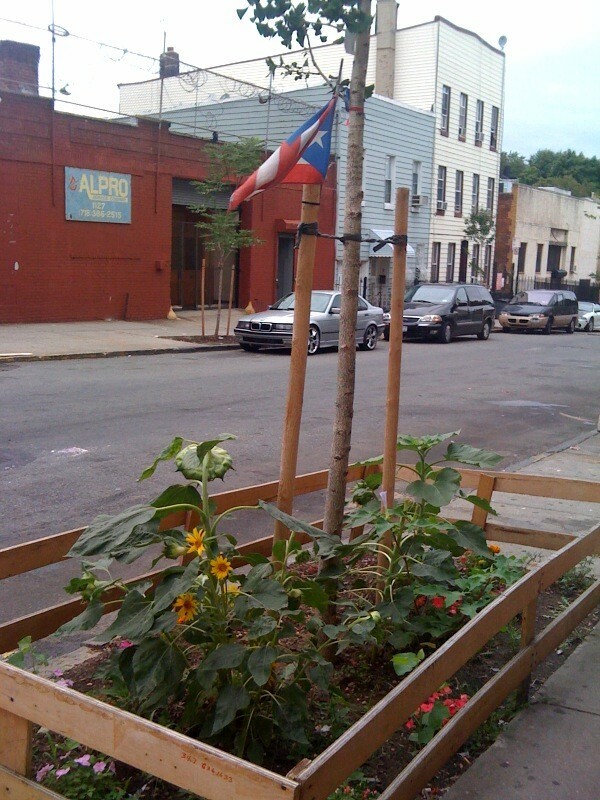 But in the last ten years city and state programs like the Bushwick Initiative, as well as the even stronger economic forces of gentrification have brought visible change to the neighborhood-- renovated housing, new businesses, fewer vacant lots. 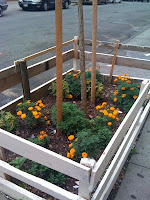 This spring, a small but wonderful transformation of the streets occurred. 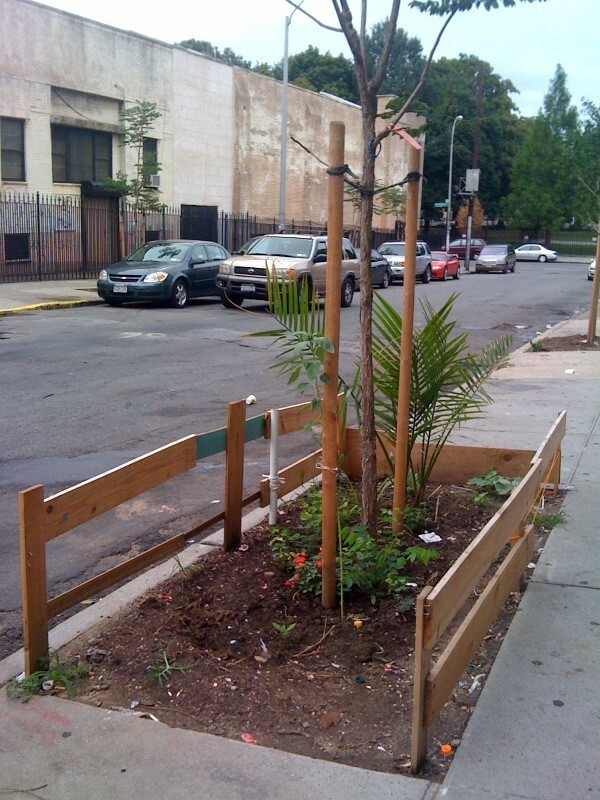 Spurred by the organizing efforts of local gardening group Trees Not Trash, the MillionTreesNYC project actually excavated hundreds of pits on dozens of streets throughout the neighborhood, planting a variety of oak, linden, flowering cherry, maple, ginkgo, and other saplings. 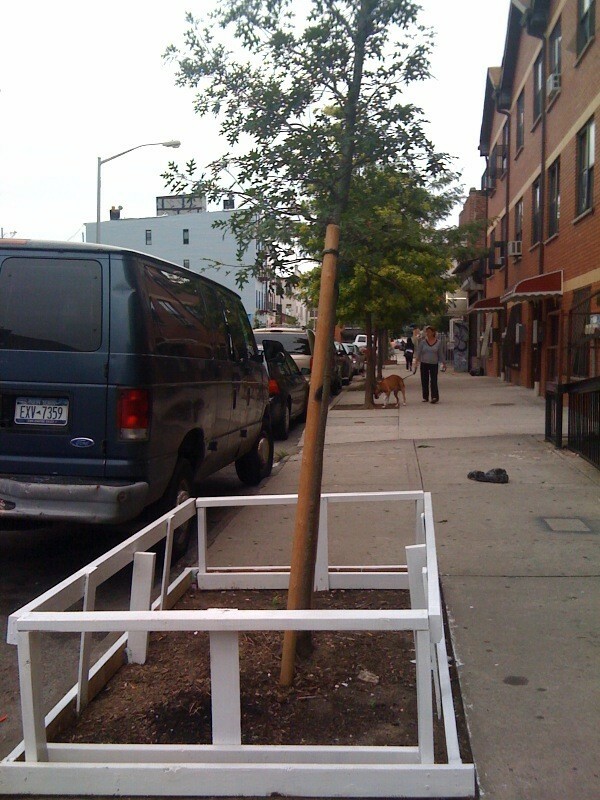 As I saw these young trees struggling to take root, I wondered how successful the experiment would be-- would they end up blighted, dried out in the summer sun, choked by trash, defiled by dogs, abused by kids unknowingly trampling their roots and pulling on their delicate branches? 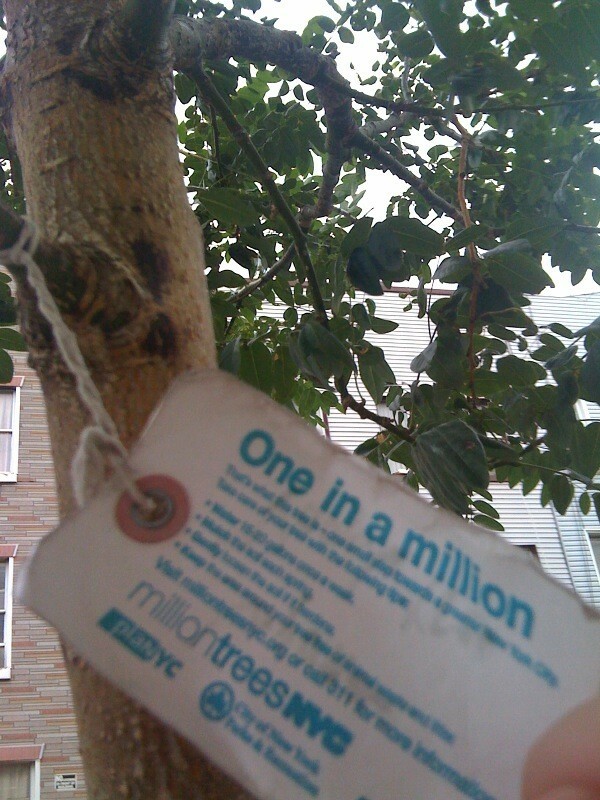 But something so beautiful has been taking place over the course of the summer, when residents take to the streets and the blare of salsa mingles with the ice cream trucks and open hydrants form babbling brooks that rinse the baking gutters... all around the neighborhood little homemade fences have sprung up around the young trees, cobbled together from scrap wood scavenged from crates and old furniture and other mysterious sources. Some of the fences get painted and decorated, some surround lovingly planted flowers and trees and flags, some evolve over time. As I walk around the neighborhood, I find these crooked fences, these small acts of community ownership of living things to be incredibly heartening and endearing. If you remember, I planted the little dirt space around the tree out front with various flowers. They looked really great, and even made the old ladies up the street smile at me when they walked by. Unfortunately, after a brutally hot July, a day or two of missed watering, and a few dogs who thought it a choice toilet, the flowers bit the dust. I stopped by Sprout Home, a local garden store, to get some expert advice as to what plants would work well in such a place. They needed to be hardy in hot weather, dog resistant-ish, preferably perennial, and hopefully green year-round. They suggested an ivy plant in each corner that would spread over a few years time. It'll stay green throughout the year and dig deep for water. Well why not just fill the square with the ivy, I asked, thinking about how that would be an easy solution. The answer - because it'll eventually choke out the tree, or at least take away too much of it's resources. Huh. Almost obvious, once I thought about it. So, I ended up with some ivies, and a few other flowery plants and desert greenery that, while they won't last through the winter, will be ok with the heat and dryness. It's not as pretty and colorful, but hopefully it'll last. Roots on the Roof: Where in the world? Greetings intrepid blog fans! I was gone for a few weeks, way gone, in some places where very little grows. Just returned to good old NYC (doesn't look like the place got much sleep while I was gone, but at least the heat wave broke). My sweetheart and I spent a couple weeks checking out America, driving from Denver up to Montana, down through Yellowstone and Wyoming and Idaho and Utah and Nevada, finally winding up in California. We passed through some serious void, places like the salt flats in Utah, where a sticky white crust covers the earth as far as the eye can see, and rainbows and lightning battle it out on the hazy horizon and there's nothing to hear but wind. And maybe a little Pink Floyd if you're lucky. But along the way, in between the hundred mile stretches of desert and dust, we saw some amazing farms, gardens, and greenhouses. People all over are planting something, folks. Up in Bozeman, Montana, my cousin Colmer's girlfriend Loren had singlehandedly planted an enormous vegetable garden in her backyard, which will soon be producing enough to feed the extended family and then some. 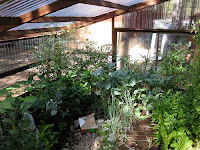 Out in Lake Tahoe, California, Sean's brother designed and built this brilliant greenhouse in his backyard. At an elevation of over 6,000 feet, and with an extremely short growing season, this simple structure now shelters thriving tomatoes, pumpkins, cucumbers, herbs, lettuce, peas, squash, and more. The air inside was fresh and rich and warm. 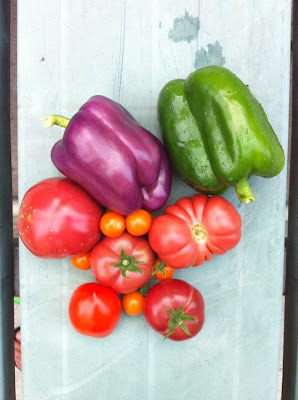 And as for our own little rooftop experiment in vegetable production, we returned to find that our plants survived our absence and the heat and horrors of the city in August. This is all thanks to our very devoted friend Diane, who faithfully climbed our stairs twice a day to douse our plants with water. Much to our amazement, we've been harvesting big, fresh cucumbers, sweet little cherry tomatoes, and slightly scalded purple peppers, and there's more on the way. So what now? 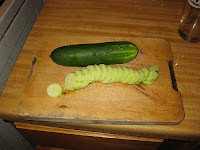 If the cukes keep on coming I will be experimenting with pickling, and I am super excited about it. Didn't you always think that it took a long time to turn something into a pickle? Apparently, it only takes a day or two. Well, dear readers, I guess you didn't wish my plants enough luck because I've had to start over with a whole new set of plants. I fought the bug infestation and lost. Remember how I mentioned that the dish soap/spray bottle concoction had killed the first type of bugs, the crawly ones? Well, it proved powerless over the little flying bugs. They would fly around all day and make me crazy. Mostly, they would fly from one end of my office to the window end, where I guess they liked to go to die, because in the morning when I would come to the office my windowsill would be covered with little dead bugs. Then, when I would go to dutifully spray my plants with the dish soap, I would notice that the soil from the Chinese Evergreen plant would be swarming with those little things. I solicited the help of one of the secretaries who sits outside my office, who suggested that I upgrade the dish soap to something a little stronger -- alcohol. And also, she noted, my Benjamin fig tree looked like it was dying. That it did. Its leaves were yellowing and every day more leaves would fall, leaving (ha) a sad little pile on the gray carpet. Enough was enough. I caved and called Richard. This was on a Thursday. Monday morning, Richard came and delivered a whole new set of plants to my office, so now I have three new plants that I intend to care for deeply. I swear the fiasco with the others wasn't my fault....I was watering and giving sun and nurturing like only a pregnant woman can. But anyway, the good news is that now I have three plants! And if Nakamura is to be believed (which he is) then three is a much luckier number than two. Don't they just look gorgeous! Esteemed and loyal readers of this blog have probably been wondering why I haven't posted in two weeks (maybe three, I don't know). First, I want to apologize. I know that many of you depend on this blog for both practical gardening information as well as the whimsical musings of people who like to grow things, and I've let you down. All six of you. So please afford me the opportunity to let you know what I've been up to. So the first session of camp ended, and we got a whole new batch of kiddies. 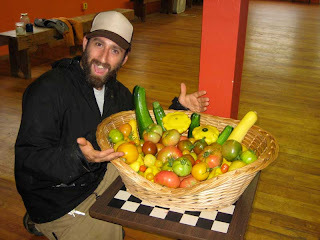 One improvement we wanted to make was how we celebrate the harvest from our farm in the dining hall. 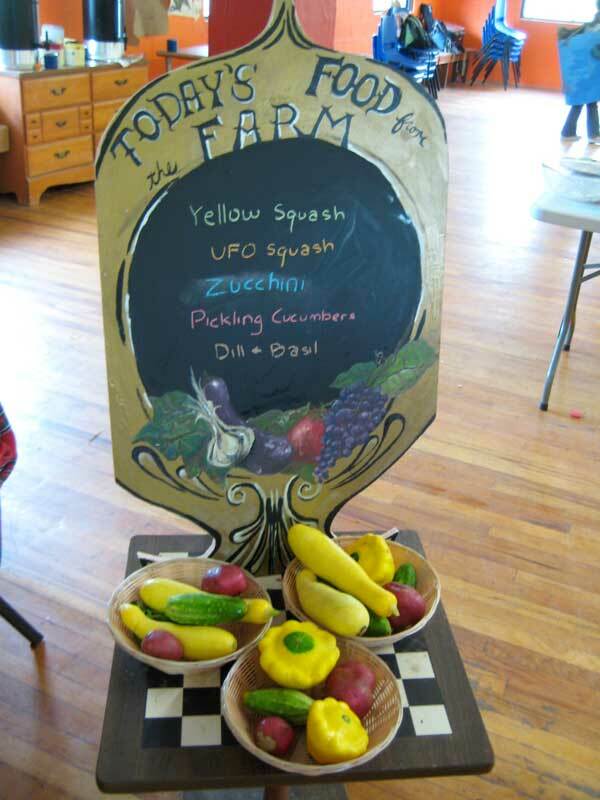 So Rachel painted a lavish sign board, and everyday we update it with what came in from the farm, along with a full harvest basket. I found the baskets at an antique shop in Cold Spring, run by an awesome artist lady who is oddly obsessed with cats. Which is cool because Rachel's last name is Katz. It all comes together. So here's a picture of the board, and another of me, somehow looking creepy in front of a basket of fresh veggies. While our farm is booming, it's still not producing enough to feed the whole camp. So Andrew, the operations guy here, in his infinite genius, got us 10 CSA shares from Common Ground Farm, about 15 miles away. I've known the folks at Common Ground for a few years, and was excited that we were supporting them in such an awesome way. 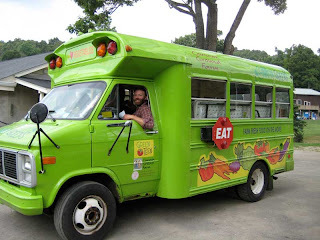 But I was even more excited when they came to make their weekly delivery in this bus. That's Tim, the head farmer, and his awesome food delivery device. He hopes to convert it to run on veggie oil this fall-we might help him out. After dropping off the food, he came into the dining hall, where he was greeted with a standing ovation from the campers. It's good to be in a place that appreciates good food and the people who grow it. What's the Deal with PlantSomething? 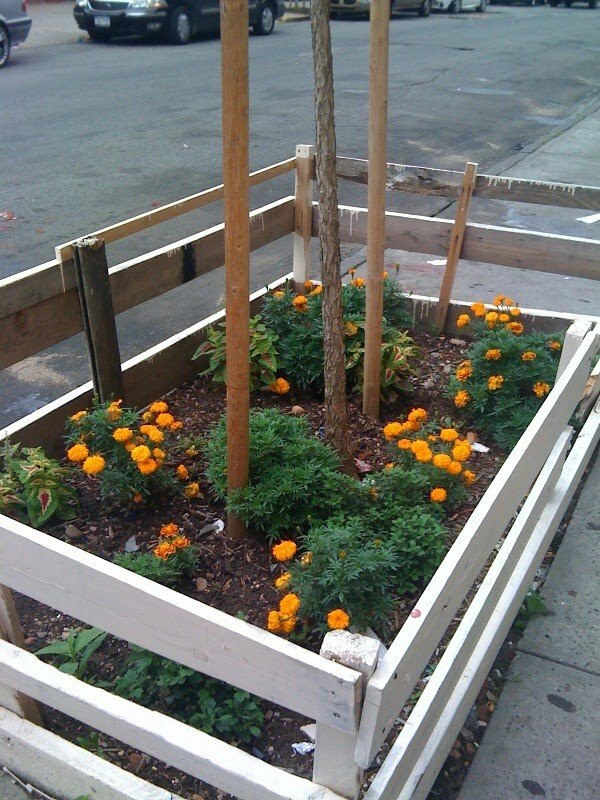 Here it is: I'm a guy who lives in an apartment in Brooklyn, and I love to plant and grow things. I grew up with a family that had huge gardens and I've always been into the magic of the process, and the good feeling that comes with having lots of greenery all over the place. I'm hoping to have all kinds of people posting on here who are growing stuff - from people growing a houseplant or two in their apartment, people growing veggies on a rooftop, to a folks working full-time on farms. The idea is that anyone can grow a plant. It's easy, fun and good for you! 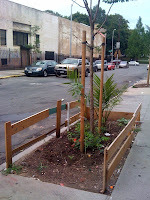 Feel free to contact me with questions, post comments, or volunteer to write a post about anything having to do with planting, growing or gardening.